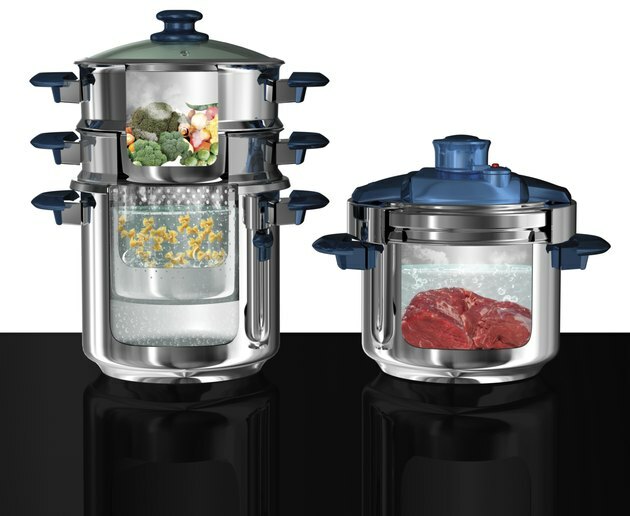 Besides saving cooking time, a pressure cooker can help you prepare a mouth-watering roast, with or without vegetables. An eye of round roast has little marbling, making it prone to drying out with conventional oven methods. Because a pressure cooker cooks with steam, the meat remains moist. Add herbs and seasonings to the pressure cooker to infuse the meat with flavor. There’s no need for a rack in the pressure cooker; place the roast directly in the cooking liquid on the bottom of the pan for tender results. Heat about 2 tablespoons of oil in the bottom of the pressure cooker. Dredge the roast in flour seasoned with salt, pepper and minced herbs, such as thyme, oregano or savory. Place the floured roast in the hot oil and brown it on all sides. Add vegetables such as sliced green peppers, garlic, onions and tomatoes at the beginning of the cooking time. Pour in enough water or beef stock to measure 1/2 inch of liquid in the bottom of the cooker. If you use canned tomatoes, pour the juice into the cooker with the tomatoes, then add water or stock to reach the correct depth of liquid. Stir a pinch of baking soda into the cooking liquid to raise the alkalinity of the food and enhance the Maillard reaction. The Maillard reaction occurs when simple sugars and amino acids combine during cooking to produce a brown color as well as a complex flavor and aroma. Seal the pressure cooker with the lid. Adjust the burner heat to maintain 15 pounds of pressure. Cook the roast for 12 to 15 minutes per pound of roast at 15 pounds of pressure. Release the steam and open the pressure cooker, following the manufacturer’s instructions for decreasing pressure. Add celery and carrots, if desired. Replace the cover and cook for 10 minutes at 15 pounds pressure. Remove the roast from the cooker and allow it to rest under a foil tent for 20 minutes before slicing. Vegetables added at the beginning of the cooking time cook to a very soft texture. If you prefer vegetables in chunks, add them during the final 10 minutes of cooking time. Placing vegetables in the cooker with the meat does not change the cooking time required for the meat. For intense infused flavor, add a whole large bay leaf to the cooker at the beginning of the cooking time; remove it before serving. Read and follow the instructions for your pressure cooker model. The internal temperature of the finished roast should be 145 degrees Fahrenheit on an instant-read meat thermometer. All American Pressure Cooker/Canner, Instructions and Recipes; Wisconsin Aluminum Foundry Co., Inc.